Kistler Pinot Noir has not gained as much notoriety as Kistler Chardonnay, yet Parker, and now his successor, Galloni, remain big fans. In 2002, Parker enthusiastically praised Kistler Pinot Noir saying, “Steve Kistler and Mark Bixler are justifiably proud of what they have achieved with Chardonnay, but what really turns them on is their accomplishments with Pinot Noir, which may be the greatest Pinot Noirs made in the New World.” I was astonished by this statement at the time because I never found the Pinot Noirs the equal of many others made in California. The Kistler style of Pinot Noir for years emphasized deep color, big extraction, thick and meaty flavors, substantial tannins, peak ripeness and alcohols, and generous oak. The wines were the epitome of what has been called “Parkeresque,” in that they were unctuous and hedonistic as Parker would say. In a Los Angeles Times article in 2008, Allen Meadows commented on the 2004 Kistler Bodega Headlands Cuvée Elizabeth Sonoma Coast Pinot Noir, which Parker awarded 96-98 points out of 100, and said the wine was “bordering on perfection.” Meadows remarked, “While the size and weight and concentration are impressive, the texture is anything but elegant.” Meadows gave the wine 86 points. I was in Meadows camp for years and eventually broke off my romance and stopped buying Kistler Pinot Noir and Chardonnay with the 2006 vintage (I found a number of comparable California Chardonnays at a more reasonable price, but that’s another story). I conducted a large tasting of Kistler Pinot Noirs in 2010 (www.princeofpinot.com/article/963/), and found that wines tasted back as far as 1998 held up well, but did not improve with age and all of them tasted the same with any nuances buried in the prodigious fruit and structure. Pinot Noir is all about aromatics and mouth feel, and the wines did not consistently deliver on either count. 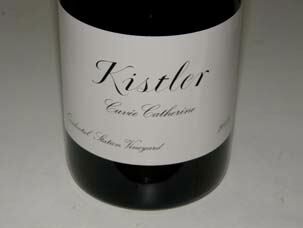 I have heard rumblings that Kistler has been striving for less extraction and more elegance and finesse in recent vintages and I decided to revisit Kistler Pinot Noir with a few examples from the 2009 and 2010 vintages. These wines, of course, are from my own collection, since Kistler prefers not, nor apparently needs to, distribute samples for review except on a very limited basis as noted above. An article ran in The New York Times (January 11, 2011) by Isaac Asimov titled “A Cult Winemaker Tinkers with Success.” Asimov confirms my remarks, saying, “For more than 30 years, restraint was not a quality remotely associated with Kistler. As Kistler’s lush, exuberant style was widely emulated, it became one of the first modern California cult wineries.” Asimov notes that in recent years the tastes of Steve Kistler have evolved and he is striving for elegance and energy rather than power, and wines that are more in tune with food. Vineyard sources in recent years have moved to the cool true Sonoma coast and the emphasis is on a diverse mix of clonal plantings with emphasis on heritage clones such as Calera and unspecified clones of French origin other than Dijon clones. Of the wines reviewed here, the Cuvée Catherine (named after Steve and Cathleen Kistler’s daughter) was assigned to the single vineyard Occidental Station Vineyard starting in 2004. The vineyard-designated Cuvée Elizabeth was produced from the Occidental Vineyard in the Sonoma Coast from 1998 to 2003, but this vineyard was acquired by Evening Land Vineyards and the designation was transferred to Bodega Headlands Vineyard in the Sonoma Coast. The vineyard designate, Cuvée Natalie from the Silver Belt Vineyard in the Sonoma Coast, debuted in 2006. The largest vineyard designate is the estate Kistler Vineyard Pinot Noir which previously was the primary or exclusive source of grapes for the Cuvée Catherine Pinot Noir from 1991 to 2003. The four wines I tasted offer generous but not exorbitant extraction and deep color, particularly in the 2009 vintage, but a moderate amount of tannins. They are appealing wines that can be approached now with decanting, and the balance of the wines predict that undeveloped aromatics and flavors should improve over time in the bottle (although tasted two days after opening, the aromas had still not arrived). The wines do offer more silk and satin textures and more overall pinotosity than I found in Kistler Pinot Noirs before 2006, but the aromatics failed to fully please. They are now commendable wines that compete with the best of the Sonoma Coast genre, and although very expensive, they are worth a try if you have the spendable income. They are well made for their style, but they didn’t do enough for me to rekindle my romance. This enigmatic winery is not open to the public, has no tasting room, and does not participate in public wine events. You won’t find this winery on Facebook or Twitter. A winery website did not appear until 2005, although the winery was founded 35 years ago. Original winemaker owners Steve Kistler and Mark Bixler decided early on to direct all their energies to vineyard management and winemaking, avoid the public eye, and let the quality of the wines speak for themselves. Bill Price, part owner of Durell Vineyard and Three Sticks Wines, is a recent minority investor in Kistler Vineyards. Jason Kesner, the assistant winemaker at Kistler Vineyards, has become a major influence on the newer style of Kistler wines and has assumed a large part of the winemaking responsibility previously shouldered by Steve Kistler. The wines are sold through a mailing list with allocation based on years of customer loyalty and volume of customer purchases (a small amount reaches fine restaurants). Minimum purchase is a case of wine or a sixpack of a single wine with each fall and spring offering. The wines are expensive, and with tax and shipping, a case readily tops $1000. If you fail to buy wine from offerings, your allocation dwindles and you will eventually be unceremoniously dropped from the mailing list. Annual production is bout 20,000 cases of Chardonnay and 5,000 cases of Pinot Noir. Magnums were bottled for the first time. 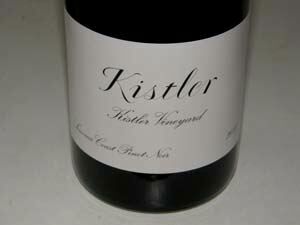 a 2010 Kistler Vineyard Pinot Noir, and offered in the fall 2012 ($180). The website is www.kistlervineyards.com. 707-823-5603. 14.1% alc., 780 cases, $90. · Dark reddish-purple color in the glass. The nose evolves slowly but beautifully in the glass, offering an array of scents including dark berry preserves, black plums, oak spice and a floral highlight. Richly flavored with slightly sweet and sappy dark fruits enhanced with subtle notes of vanilla, tar and fennel. Very silky in the mouth with admirable length on the luscious, fruit-driven finish. The next day when tasted from a previously opened and re-corked bottle, the nose had a green note yet the plush fruit flavor was hard to ignore. This wine will find fans among those who relish big-boy Pinots. Good (+). 14.1% alc., 535 cases, $90. · Dark reddish-purple hue in the glass. Very shy nose initially, offering scents of dark berries and cherries and spice, picking up intensity over time in the glass. Well-endowed with ornate flavors of plum sauce and blackberry jam robed in firm but not aggressive tannin, finishing with welcome Pinot charm. Tasted the next day from a previously opened and re-corked bottle, the nose was still shy with a leafy, floral tone, yet the flavors were remarkably enticing with impressive length on the finish. Very good. 14.1% alc., 915 cases, $90. · Dark reddish-purple color in the glass. The nose is closed for business showing primarily oak-driven aromas. Mid-weight core of dark red and black fruits that are flavorful and bright, but less intense and sappy than the 2009 wines. The tannins are nicely balanced and the finish is driven with notable citrus-laden energy. Tasted the following day from a previously opened and re-corked bottle, the wine’s nose was still closed with a hint of dark red fruit and oak spice. Still very flavorful with plentiful, sappy fruit, smooth texture and some length on the fruited finish. Very good. 14.1% alc., 2,135 cases, $80. · Dark reddish-purple color in the glass. Shy aromas of black cherries, spice, and subtle mint. Very soft and smooth in the mouth with charming flavors of Bing cherries and cranberries underlain with spice and cola. Juicy, with bright acidity on the back end. The velvety texture is most alluring. Tasted the next day from a previously opened and re-corked bottle, the minty note on the nose had disappeared, the aromas were very pleasant and the wine was still flavorful. Very good.